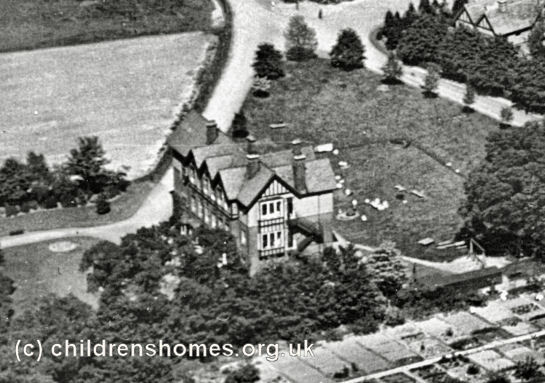 In August 1873, Thomas Barnardo and his new wife Syrie moved into Mossford Lodge on Cranbrook Road, Barkingside, near Ilford. Barnardo had been given the lease of the property for use both as a residence for himself and Syrie, and also as premises for a new home for girls. Barnardo's previous work in rescuing destitute children from the streets had focused on the boys, a constraint resulting to some degree from his own bachelor status. The use of Mossford Lodge gave him the opportunity to remedy this with the establishment of a home for girls who would be trained for domestic service as house-maids, kitchen-maids, cooks, laundry-maids and so on, with Syrie managing the establishment. The property's coach house was converted for the purpose at a cost of £100 and in October 1873 first twelve girls moved in, a number which soon rose to fifty-four. "I was rescuing little English nomads, some of whom might truthfully be described as girl savages. The life stories of some of my first inmates were shocking in the extreme, appalling in their revelations of neglect and degradation... One of these cases, for example, was that of a child who had twice attempted to take her own life. Another, a girl of only nine, had filled a baby's mouth with sand and sat on its face! And yet, I declare absolutely, that that child was not really of a cruel nature: there was no murderous intent; there was simply intense curiosity to know what would happen, followed by and by with a feeling of real sorrow when she realised how the poor baby had suffered. Like an untutored savage she had no imagination: her nature had never been developed: she was incapable of putting herself in another's place. This girl had no father and no mother: she had been rescued from the possession of a woman who wandered as a vagabond over England with the baby which was not her own child, and of whose parentage nobody knew anything... Among my first thirty girls I had as many depraved children gathered in our little Home as I suppose have ever been aggregated under one roof since then. These were mostly criminals in embryo, the offspring of degraded and vicious women." After eavesdropping on some of the girls' 'vile conversation', Barnardo began to feel that his task was hopeless. It had also become apparent that Syrie lacked the necessary experience and skills to run the home. The birth of the their first son further added to the couple's difficulties. Accordingly, the Mossford Lodge home was closed in 1875. Faced with the failure of what he now viewed as just an experiment, Barnardo began formulating plans for rather different style of establishment. The result, created on a large plot of land adjacent to Mossford Lodge, was to be the Girls' Village Home. When Mossford Lodge's lease was about to expire in 1888, Barnardo heard that a Roman Catholic sisterhood was planning to acquire the building and 26 acres of adjoining land. Barnardo always had an intense hostility towards the Roman Catholics and viewed this as a 'Romish plot' to interfere with his work. He immediately launched an appeal for funds and soon secured the required £7,000 needed to buy the property. Mossford Lodge was mainly employed as staff accommodation and continued in use until 1965 but was subsequently demolished. The site is now occupied by Barkingside Magistrates' Court.